John Henry Jewell was born in Gloucester, the son of a store manager. In 1891, he was aged 9, a schoolboy living with his parents at the Oil Stores, Hempsted. By 1901 he was still living with his parents, but now at Hartington Road, Tuffley and he was working as a turner (iron) fitter. Later that year he made his debut for the full Gloucester side at Cheltenham on 23rd November, because Gloucester had 12 men absent playing for the County against Somerset. Nevertheless, the weakened Gloucester side won 3-0, thanks to a try by the veteran Walter Taylor, who had come out of retirement to perform again in his Club’s hour of need. However, John Jewell had established his credentials as a worthy first team player, and he quickly became a first choice selection amongst the forwards, playing in 22 of the 25 games remaining in that season. He scored his first try for the Club on 27th December 1901 in the away match at Bath, which Gloucester won 26-0. 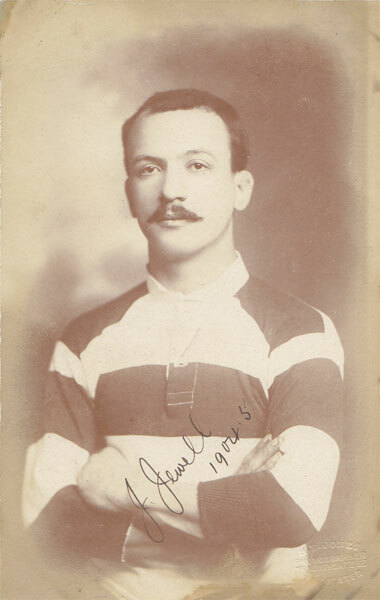 Although John played in 20 of Gloucester’s 37 fixtures during a very successful 1905-06 season (26 wins and only eight losses), he was unfortunate not to play in the biggest match of the season against the touring All Blacks. Contributing to his absence was the decision by Gloucester to play only seven forwards in order to accommodate a third half-back, a ploy which failed as the All Blacks steamrollered Gloucester 44-0. John scored his final try for Gloucester in the 16-0 defeat of Bath at Kingsholm on 9th December 1905, and he played his last game for the Club in a County Cup match against Bream at Kingsholm on 24th February 1906, which Gloucester won 68-0. He finished his career for Gloucester with 77 appearances, five tries and 15 points.